Mobile operator Vodafone today launched a digital music download service where you can buy unlimited tracks for just £2 per week. Vodafone's MusicStation service will be launched on Vodafone's latest range of mobile handsets, while existing Vodafone users can download the MusicStation software and sign up for a free trial. The service will work on 70 per cent of the world's handsets, according to the mobile operator. More than 1m tracks from four major record labels will be available. The tracks will be downloaded straight to your mobile phone, and for £2 a week you'll get unlimited tracks. A £3 per week service allows you to browse the MusicStation back catalogue and buy music from your PC or Mac. "This is a first for music on the mobile in the UK and means a fundamental change to the way people experience music on their phones," said Tim Yates of Vodafone. 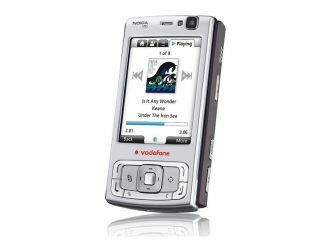 A total of 18 new handsets from Nokia, Samsung and Sony Ericsson, among others, offering the MusicStation service plus mobile internet access will be launched this side of Christmas. Most recent mobile handsets are able to store and play music tracks, but only a handful of services let you download tracks straight to your mobile phone. Two weeks ago, Nokia launched its own music download service, Ovi, which lets you buy tracks and download them straight to your handset. And in the US, Apple iPhone owners can buy music wirelessly from the iTunes Wi-Fi Store.